The end of 2008 is almost here. And, of course, that means year-end top 10 lists. As it happens, our one-time governor made it onto a few of those this year. OK, it was actually more than a few. It's a first place finish for Eliot Spitzer in what can only be regarded as the Rose Bowl of political scandal year-end top 10 lists. 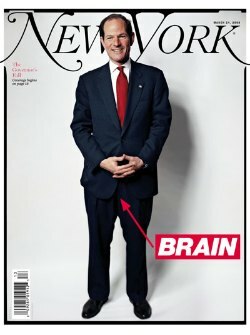 New York's "Spitzer's Brain" cover takes the #2 spot, right after the New Yorker's Obama victory cover. The spitzering takes the #3 spot, right after the Madoff pyramid scam and Rod Blagojevich. If only 2008 had been 11 months long. OK, not technically a year-end list. Spitzer scores the #8 spot, once again relegated after the recent mess in Illinois. Blagojevich! The CNN'er gives another win to Spitzer. Ah, but let the record books show this list was compiled before the Blagojeviching came to light. A bronze medal finish in this one, but Spitzer has to share with it John Edwards and Tim Mahoney. The gold medalist in this one? Amy Winehouse. The Spitzer story gets a #7 ranking here. Spitzer takes just the #9 spot here. By the way, Durst is described as a "political comedian" -- after reading this list, though, we get the feeling that maybe you had to be there. Or something. Alas, no rankings here -- but some upscale company (Obama's win, Hillary for Secretary of State). Another number one ranking for our former governor, as he edges out Kwame Kilpatrick and -- um -- David Paterson. Is this your tango? It's certainly not ours. Whoever it belongs to, it ranks the spitzering at #5. And with what cold logic: "This goes in the 5 Slot because he's not really a celebrity."